there at the Texana Olive Ranch in Artesia Wells. Find out why they labor and toil in their olive orchard and continue to expand their reach. Please take a look at all the other information on events and opportunities included in this issue — they can help you promote and expand your business. If there are any other ways we can serve you through our GO TEXAN program, please don’t hesitate to contact our great staff. We have a great team, and we want nothing more than to promote the products, culture and communities that call Texas home. I hope you enjoy this issue of GO TEXAN Round-Up infoletter. Remember friends, Texas agriculture matters! TEXANA BRANDS: FOR THE LOVE OF OLIVES ONE OF THE GREATEST BLESSINGS IN LIFE IS TO ENJOY YOUR JOB. THINK ABOUT HOW MUCH OF OUR TIME IS SPENT WORKING. HOW GREAT IS IT WHEN YOUR JOB IS PART OF A BIGGER PICTURE? MANY GO TEXAN MEMBERS COULDN’T BE HAPPIER OPERATING THEIR BUSINESS RIGHT HERE IN THE LONE STAR STATE. JUST ASK TEXANA BRANDS’ MANAGING PARTNER, MICHAEL PAZ. virgin olive oilâ&#x20AC;? actually contain extra-virgin olive oil. changes color from green to black as it ripens. He advises consumers to buy fresh, buy local and know where you are buying from. It brings the go local movement into perspective. 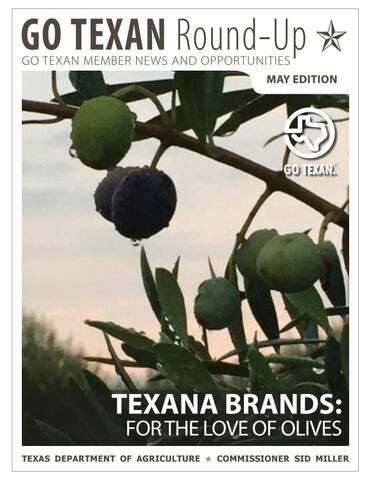 Texana Brands will continue in their labor of love, appreciating the chance to work in a rewarding field and sharing their passion about olive oil with anyone who will listen. For more information about the company, visit their website. What: The Ultimate Women’s Expo When: May 20-21, Sept. 9-10 and Sept. 30 - Oct. 1 Where: Houston, Dallas, San Antonio Details: All booths include a 6’ draped and skirted table, 8’ draped backwall, chairs and corporate signage with your company name. Standard inline booths are $950 in Houston/San Antonio and $1,150 in Dallas. When you sign up for two shows, you will receive a $150 discount off your booth package. For more information, contact Tina Matteri at (866) 618-3434 ext. 416. What: Nursery Landscape Expo When: August 10-12 Where: Dallas Details: Discover the latest green industry products and gain a new perspective as you meet face-to-face with thousands of industry experts. Share new ideas by participating in over 32 education breakout sessions and two notable keynote presentations. This is where unique products are found, great ideas are born and creativity and innovation unite. For more information, click here. What: TRA Marketplace When: July 9-10 Where: Dallas Details: The Southwest’s largest gathering place for restaurant industry movers, shakers and bakers. This event is four months away and already more than 71 percent sold out. GO TEXAN members get an exclusive discounted 8x10 booth space for only $1,500 (normally $2,240). Ask about the GO TEXAN Pavilion. For more information, contact Chris Cobb at (512) 457-4194.
nuts, baking mixes and ingredients, dairy products, snack foods, baby foods, breakfast cereals and ready-to-eat foods. Registration deadline is May 5. For more information, contact Carlos Guerrero at (512) 463-6507.
information, contact Carlos Guerrero at (512) 463-6507. What: Tap Into Downtown Odessa When: September 30 Where: Odessa Details: This 2nd annual craft beer and wine festival will feature live jazz and acoustic music, food trucks and more. To sign-up as a winery, fill out the winery participation form here and return by Friday, June 30. For more information, contact Haley Howey at (432) 335-4683.
retailers and suppliers for over 30 years. Fee includes a 10x10 booth space and SUSTA booth signage. Not included is the PLMA membership fee (cost is $1,000). Registration deadline is June 23. For more information, contact Carlos Guerrero at (512) 463-6507. TDAâ&#x20AC;&#x2122;S GO TEXAN PAVILION AT THE STATE FAIR OF TEXAS The 2017 State Fair of Texas will be here before we know it! 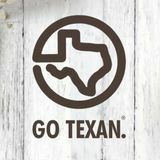 We are currently accepting Early Bird applications for the GO TEXAN General Store in the GO TEXAN Pavilion (September 29 - October 22). The one-of-a-kind GO TEXAN General Store boasts the largest collection of Texas-made food and gifts on the fairgrounds. Promoting your company in the GO TEXAN General Store and sampling your product is a great opportunity to shine in an all-Texas product setting. Visit GOTEXAN.org or email TXStateFair@TexasAgriculture.gov for more information. Congratulations to Brennan Vineyards, Llano Estacado Winery, Lost Oak Winery, William Chris Winery and Los Pinos Ranch Vineyards, who were all highlighted in a â&#x20AC;&#x153;Top 10 List of CabernetSauvignonâ&#x20AC;? on Texas Wine Journal. Buc-ee’s was named “America’s Best Pit Stop” on Thrillist. Karbach Brewing Co. was chosen as one of the “Must-Visit Breweries in 35 Major Cities” on Thrillist. The Dallas restaurant, Canary by Gorji, was spotlighted on WFAA’s Good Morning Texas. Gulf States Toyota was featured in the Houston Business Journal. Our condolences to the Friedkin family and the team at GST. THE TRADING POST WHERE GO TEXAN MEMBERS CAN BUY, SELL, NETWORK AND TRADE WITH ONE ANOTHER. with twice the customer appeal and at a reduced cost to you? Contact Quality Brand Promotions and weâ&#x20AC;&#x2122;ll help connect you with other interested members, to set up the sampling events. They cover every single city in Texas, with well-screened ambassadors, to do the sampling for you and spread awareness of your brand. For more information, Contact Thomas A. Simon at (512) 491-7911. Post #3 Smart Tax Holiday: On May 27-29, garden centers, nurseries and home improvement stores across Texas are participating in a lawn and garden smart tax holiday. This is a time when you can save on products that help to conserve water. Purchase any plant, many mulchers, drip irrigators and more without paying sales tax. For more information on what you can purchase and how to save water, please visit landscapetexas.org. Mouse over their photos to see which region each Field Representative serves, and click on their photo to send them an email. The latest news, events and opportunities exclusively for GO TEXAN members.